Prior to and during 2009 pandemic, there was discussion of whether triage protocols should be used to restrict access to critical care to a subgroup of patients. 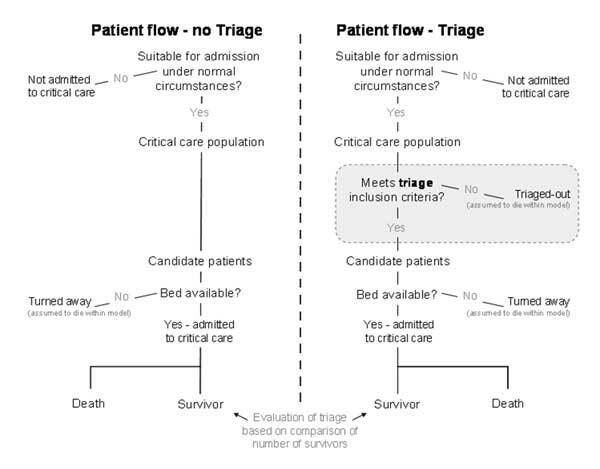 Thought experiments and simple, data-free mathematical modelling were used to stress the importance of a triage process having a clear objective and to highlight the nature and scale of differences there would have to exist between groups of patients before triage could confer benefit. Initiated prior to the 2009 H1N1 pandemic, this work became a focus of much attention and debate within the paediatric intensive care community during the pandemic. Our work fed directly into guidance issued by Paediatric Intensive Care Society and informed discussions between the professional societies and the Department of Health around the use of critical care resources. Published protocols for implementing triage to critical care during a pandemic were reviewed and found to lack clarity in terms of the objectives of triage. A model based on insights from queueing theory was devised that allowed estimation of outcomes for systems with and without the use of triage. The model was then used to identify circumstances in which triage conferred net benefit in terms of the number of survivors across the system.